Edit, spot, and render subtitles for DVD authoring. Is there a better alternative to Sublime? Is Sublime really the best app in Video category? Will Sublime work good on macOS 10.13.4? Sublime is a program to edit, spot, and render subtitles for DVD authoring, mainly for Apple's great authoring suite DVD Studio Pro. You can directly use QuickTime movies and even compressed MPEG2 videos with speed and accuracy you've never archived before. Sublime needs a rating. Be the first to rate this app and get the discussion started! Seamlessly integrates into DVD-Studio Pro - DVD Studio Pro is a great authoring application but only offers rudimental subtitling features. Sublime perfectly supplements and integrates with DVD Studio Pro, filling the gap that DVD Studio Pro leaves in this area. Supporting PAL and NTSC videos, Sublime offers composing and export of graphic and text subtitle files. Using Sublimes bitmap renderer, you will never have kerning problems again and can even use antialiased fonts and other highly customizable text styles. Realtime Transcription and Spotting - One of the biggest advantages of Sublime is its user-interface: With its intuitive arranger, you can see video and audio and edit subtitles all in one view and workflow. Subtitles can be easily put to their place via drag and drop or keyboard shortcuts, if you prefer working with them. With the subtitle list editor you always have an overview about all your titles. Transcription and spotting has never been easier and faster! Text Style Grouping - The styles feature in Sublime is a powerful way to quickly group the appearance of multiple subtitles for actors, lyrics, off voices, and so on: You can e.g. assign every speaker a different font and color or set the text italic or bold. Later on you can change these settings for all the subtitles in one style with a single click. Even the alignment of the subtitle text can be stored in a style, so that you can move subtitles from the bottom of the screen to the top if they would cover text that is printed in the video. High quality video export - With Sublimes video export feature you can render your Sublime project as a Quicktime movie. This movie can be played back on any computer that has Quicktime installed (Sublime is not required for playback). This way you can create presentations of your work, or create high quality subtitled movies without having to author/render them in DVD Studio Pro. 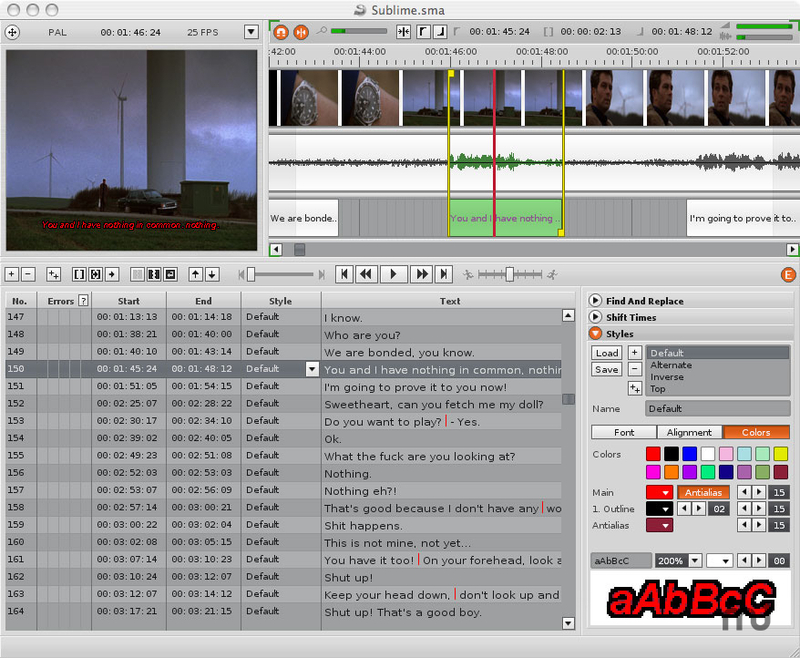 Further, the video export allows to render movie files which only contain a video subtitle track. This video can then be imported into e.g. Final Cut Pro, to create and edit subtitled movies. Preview Video and Titles in Realtime - The video preview window gives you the opportunity to view your subtitles as they will look on television later, using different aspect ratios and resolutions. If you have got a dual monitor configuration, you have the possibility to preview the video with the overlaid subtitles full-screen on the second monitor. Advanced Editing - Tape-offsets, auto line wrapping and splitting, merge, duplicate, find and replace, time shifting and more.